Bill Warren Painting Service is a local Darwin based company that provides the highest standard of Quality, Service and Workmanship across Darwin, Katherine, Alice Springs, the Top End and even remote and Central Australia. All of our work is designed to stand up to the unique conditions of the Northern Territory, ensuring that the finished product not only looks good, but will continue to do so for years to come. We take a personal interest in keeping the properties we work on looking great. We aim to develop relationships with our clients to ensure they get all the advice and support they need, whether it’s during the job, or months, or even years down the track. Being Northern Territory locals, we’ll still be around to do this. 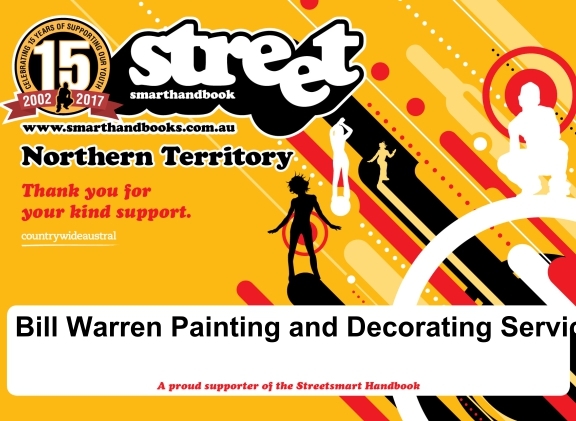 Here at Bill Warren Painting Service, we pride ourselves on having the products, tools and people to undertake any painting and decorating job in the Northern Territory – large or small. We are able to work with a wide variety of suppliers and painting systems including spray booth work that requires a fine paint finish. We know the importance of balancing what works for us (recommended products for different surfaces and conditions), with what works for you (the look and finish you are trying to achieve). Our workmanship, preparation and clean-up are second to none, and we always ensure that we undertake thorough preparation including sealing, priming and base coats. Being local Territory Painters, we know the specialized preparation and application required to ensure the paintwork lasts in our unique climate.